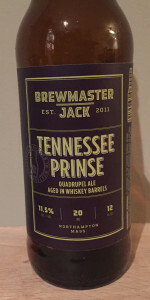 Tennessee Prinse begins its life as our base Quadrupel Ale, Prinsipia. Named after Newton's most famous work, Prinsipia gives wonderful flavors of candied plum, brown sugar, biscuits, tobacco, and cherries. With percise planning, the beer is transferred into oak barrels which, less than two weeks prior, have been emptied of Tennessee Whiskey. The barrels allow flavors to mellow but also infuse notes of vanilla and toffee. Dark mahogany body; thin yet lasting light tan head. Rather faint dark grain and dried dark pitted fruit smells. Rich flavored dark grains; a little smoky; roasted malts; mildly sweet chocolate notes. Heavy, velvety body; smooth and thick on the palate; semi-sweet feel. A big beer with an ABV needing respect as the beer can go down easy. Poured into a chalice, the appearance was a dark brown close to black color with a thick finger’s worth of white to off white foamy head that dissipated at a nice pace. Spotty stringy lacing runs around. The aroma starts off with the dark fruits opening up into some milk chocolate and Belgian spices. Sly woodiness underneath. Some vanilla. Bourbon whiskey is very light. The flavor leans to the sweet initially and then opens up into some subtle nuances of Belgian spice. Sweet fruity to chocolatey aftertaste running into the finish smoothly. On the palate, this one sat about a medium on the body with a fair sessionability about it. Carbonation felt appropriate, semi-smooth. Overall, pretty good as a barrel aged quad. I'd drink again. From a 12oz bottle, undated so far as I can tell. Served in a tulip. Pours a very handsome cola brown with a finger of rocky foam the colour of a nicotine stain. The head quickly settles back into a sparse cap with a modest ring around the glass and very little lacing. Smells smooth and rich, of caramel cream and applewood. Not bigly on the nose, with very little of the alleged barrel in evidence. Taste is... ah! There's the barrel! Booze-soaked golden raisins, cider, plums and cherries, damp wood drying in the sun, tobacco leaf and old, worn leather. Finishes with just a suggestion of smoky booze. Feel is silky-soft but maybe a little thin, medium-light bodied for the style, gently carbonated, and smooth-drinking with not much of that big abv detected. Overall, a very nice beer. As noted, a bit thin to the style, more like a dubbel. I saw the label and stated abv on the bottle and expected it to come out punching. Instead, it was gentle and understated and quietly delicious. Much enjoyment. A: The beer is black when viewed from afar, but when held up to a bright light the beer is very dark brownish red in color. It poured with a short dark beige colored head that died down, leaving a patch of bubbles on the surface and a collar around the edge of the glass. S: Moderate aromas of dark fruits and whiskey are present in the nose. T: Similar to the smell, the has lots of flavors of dark fruits such as cherries and plums along with notes of whiskey and brown sugar and hints of oak and vanilla. M: It feels medium-bodied on the palate and has a moderate amount of carbonation along with slight hints of warming from the alcohol. O: This beer does a very good job at balancing the aromas and flavors of the quadrupel with whiskey barrel aging. Any traces of alcohol are also very well hidden from the taste. Pours dark brown, minor head and leaves just a smidge of film, thin colar and a thin ring or two of fine lacing. Kinda thin for the style body and mouthfeel wise. Malty, with notes of rum, figs, assorted ripe fruits and again sweet dark malts. No bottling date. Served cold in a snifter. Looks like a quad. Smells like a regular quad and I barely get any barrel character on this one. It isn't overly boozy like I would expect from a freshly emptied whiskey barrel. None of the classic barrel-agedness character that should come with a beer spending time in a fresh barrel. Aside from that, it is a good quad. Tons of dark fruits, nice fusel alcohol notes, medium light body. I just wish there was more barrel. Note, got another bottle and adding some more notes as it's mellowed and aged a bit. Dated sticker must have fallen off, hence the problem with dating via stickers. Pours a dark creamy 1/2 finger head that fades at a med pace, decent lacing, pitch black beer. Nose brings plenty of whiskey, more like a cheap Jack Daniels whiskey which is not too good, sweet candy malts underneath, caramel, candi sugar, molasses, some dark fruits like candied date and fig, a touch of biscuity toffee. NEW NOTES: more candied dark fruits, lots of date and raisin, molasses sweet brown sugar, whisky has subdued and is more vanilla oak barrel now. Taste brings sweetness, big sweet malts out front, Belgian dark malts, Belgian candi sugar, toffee, molasses, caramel notes, etc, but not super sweet, into dark fruits again, candied fig, sweet dates, booze almost dark rum soaked raisin, some warming tingly booze, chewy like candy syrup, etc. Mild whiskey, again super cheap whiskey and not so great, I guess the brand for the barrels really does make a difference. Finish is sticky sweet, big sweet candi sugar, dark candied fruits, some warming booze, little cheap icky whiskey. NEW NOTES; Whisky is still mostly there, more vanilla sweet bourbon flavors than cheap whisky but that cheaper young whisky is still there, lots of date and candied molasses brown sugar fruits, plenty of oak and vanilla. Mouth is full bod, syrupy thick, decent carb, plenty of warming booze. Overall base beer is def detracted by the cheap not so great whiskey. NEW NOTES: however the aging has settled out the young cheap whisky for more barrel notes and a decent character, the base beer comes through a bit better now and it's more balanced. Definitely aged this for a few months before cracking.